Welcome, new friend! I was thinking the other day that it’d be nice to have a post to orient new folks to the blog, so…here it is! Hello from the great beyond! (By the great beyond, I of course mean this mystical time post-MBA graduation.) Predictably, my second year at Kellogg was just as crazy as the first one, but I did manage to graduate in June (yay!) and have been traveling and spending time with family and friends as I skate into a January start date in consulting. Now, since I’ve got some time on my hands and Round 2 application deadlines are just around the corner, I want to offer some time up to the lovely folks still reading this blog. I’m offering essay reviews to the first two people to contact me about this blog post. Hope you’re all having a super lovely holiday! It’s been a while since my last post, which unfortunately isn’t a surprise because business school is ridiculous. I survived recruiting and have a lot of thoughts about the start of school, so expect new posts to come your way before too long (hopefully) about that. #OscarsSoWhite is so hot right now. And it’s an extension of a larger conversation this past year about diversity in Hollywood across both racial and gender lines. As a biracial woman who worked in entertainment, I’m passionate about this convo and have been keeping up as best I can (thanks a lot, recruiting). So as we head into Oscars weekend, here is some background for you to explore. Holy crap it’s December!! I just narrowly survived finals (YAY! ), and you are in the final stretch into submitting R2 applications. Hopefully at this point you’ve taken a crack at your essays and resume, you’ve taken the GMAT at least once, and your recommenders know that they’re going to be writing recs for you. This time of year was really stressful for me, so I’ve got a few pieces of advice for you at this stage of the process, as well as a collection of some resources to help you prep! Stranded in Oakland = Finally, Time to Write! Oh hey there! Greetings from a lovely Oakland airport hotel, where I’m spending the night before heading to LA for the start of Thanksgiving break. For those of you who aren’t traveling or who don’t live in the Midwest, we had our first snowstorm of the year yesterday, after a long fall of temperatures in the 50s. Winter is here, y’all. And it doesn’t give a crap about our travel plans. On the upside, I met a very nice Kellogg grad (class of ’82) who is also stranded at this airport hotel, and the staff here is very nice, even though I look (and feel) a little (a lot) crazy. Also on the upside, having a little break from my plans is giving me some time to write! I’ve been dying to tell you about so many things, but this MBA thing really is as hectic as people say it is, and it’s been very hard to find time to reflect and write. But that changes tonight! I’ve been kind of a shy bird about this for some reason, but I figure it’s time to just own it: I was featured on Accepted.com’s blog! They asked me to answer some questions about my MBA application experience, and I did. I answered a LOT, you guys. So verbose. Click through to read the whole interview, if you’re interested. I do some talking about things I’ve mentioned on the blog so far but haven’t gone into a ton of detail about, like building story and some reflections about life at Kellogg so far. It’s Forté time! Any ladies out there planning to apply to start their MBA in 2017 should look into this program — I’m a past participant and huge fan and can’t recommend it highly enough. Applications are open until November 15th! The MBALaunch locations for this upcoming year are Chicago, Los Angeles, New York, Washington DC, Boston, Houston, London, and Toronto. If you live near but not in one of those cities, you can travel to the city for the initial launch event then join Forté’s virtual program for the rest of the year. Have you decided to get an MBA but don’t have the network to stay focused or don’t feel prepared enough to make grad school a reality? 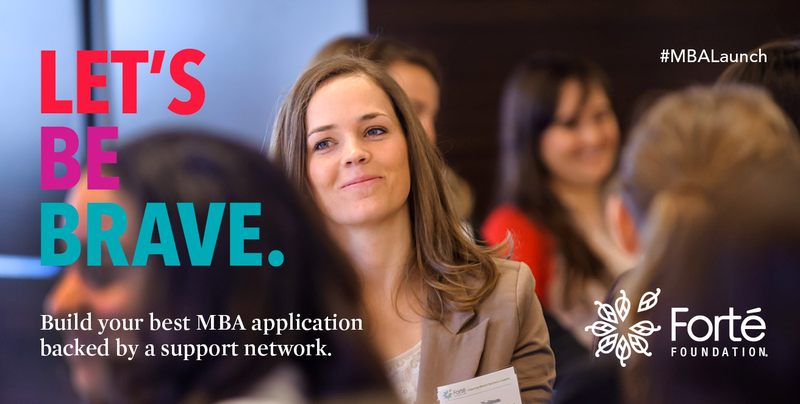 Get focused with Forté MBALaunch, a 10-month program that pairs women seeking an MBA with a support network and provides a structured roadmap for applying to business schools. $25 application fee + $500 program fee. Upon completion of the program, you’ll receive application fee waivers from more than 20 Forté schools and discounts from leading GMAT test prep providers and admissions consultants that can recoup the total cost of MBALaunch. Keep your head in the game and best of luck with your applications! Oh man, you guys. This is wonderful. Netflix has released the results of a study it did of when people get hooked on TV shows. They defined the “hooked episode” as the episode after which 70% of viewers went on to complete the first season of that show.